Develop a theme. Parties are always better when they have a theme. A holiday theme can range from the football playoffs to a winter wonderland or Christmas celebration. Knowing your theme can guide your decisions about food, site and dress for your guests. Choose your site. There are many options for hosting a holiday party. You can book an elegant party at an art gallery, museum, or nature center or even host a larger event at a party center or conference center. The choice of site will help determine how many people you can host and what theme might work better. Create creative invitations. Having creative invitations is a great way to set up the theme for the party well before it ever begins. For a tailgate football playoff holiday party, send bags of peanuts with the invitation, or for a more formal party, send lovely ornaments to accompany the event dates. Choose your menu. Choosing your menu carefully is the best way to make sure that your theme is carried through your party. Ethnic foods, formal dinners, casual get-togethers – the options are unlimited. An Akron caterer can help you to determine the best foods for your party. Collect RSVPs. Once your holiday invitations are out, make sure to keep track of who is coming and who is unable to attend. Sending your invitations out four to six weeks ahead of your party date is the best way to ensure a good turnout. 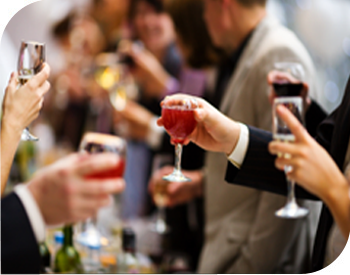 Planning a holiday party can be a fun, enjoyable way to spend fall hours. When you get started early, you’ll have more options for sites and to create memorable party details. Call Special Moments Catering today to schedule your holiday parties.